As was expected, the Advocate-General’s opinion (not yet available in English) in the Deckmyn case was released this morning. This dispute involves interesting questions such as the interpretation of the parody copyright exception, the requirements attached thereto and its relationship with other fundamental rights. The provision concerned is Article 5(3)(k) of the Infosoc Directive which allows Member States to introduce an exception to the reproduction right (Article 2 of the Directive) and the right of communication to the public (Article 3 of the Directive) for the purpose of caricature, parody or pastiche. As the English introduction of a parody exception is being currently delayed, along with the continuation of criticism surrounding the Infosoc directive, the AG’s opinion is very much welcome. Additionally, as Member States have the habit of tailoring copyright exceptions to their legal traditions, the AG’s opinion (despite its lack of binding effect) is a meaningful clarification of the meaning and scope of the parody exception at EU level and provides insight as to its interplay with other fundamental rights. The facts are pretty straightforward and concern the distribution of a calendar of which the front page reproduces a well-known Spike and Suzy (Suske and Wiske) album cover distorted in a way to promote a political message of the Vlaams Belang’s party (Flemish nationalist political party). 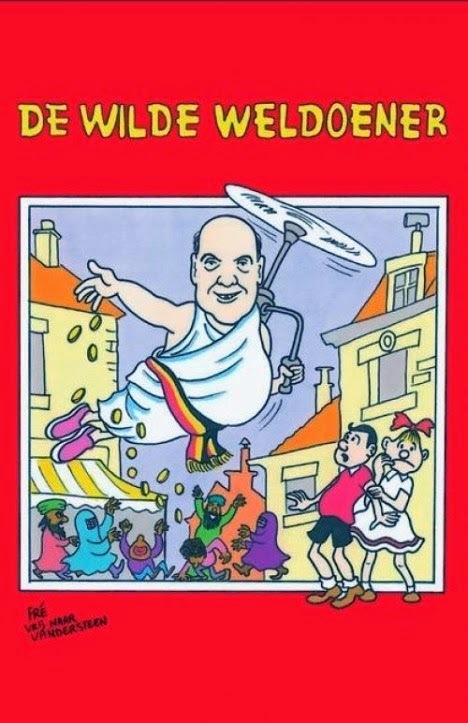 Unequivocally, the alleged infringing work represents the City of Ghent’s Mayor, Mr Termont, wearing a white tunic with a belt displaying the Belgian colours, distributing money to people from different backgrounds. This calendar was distributed during the party’s New Year’s Eve reception and later, in brochures as well as on the party’s website. 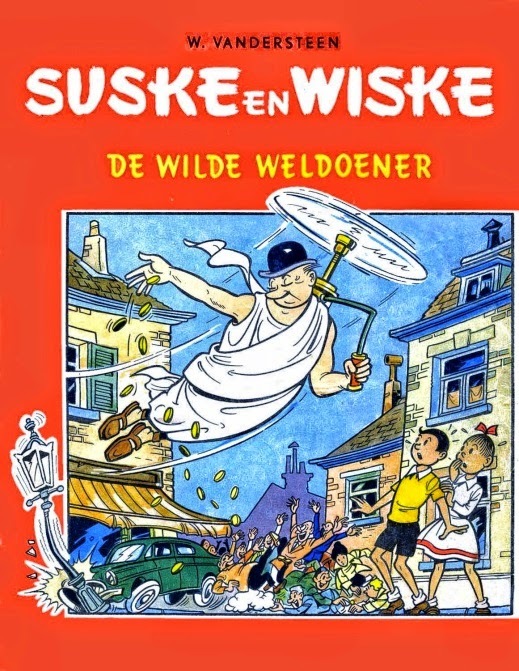 Consequently, the heirs and rightholders of Mr Willebrord Vandersteen (the author of the comic albums) claim infringement of their copyright in the comic albums against Mr Johan Deckmyn (member of the Vlaams Belang’s party) and the Vrijheidsfond, the association responsible for the party’s funding and promotion. The applicants argue that the alleged infringing drawing reproduces the general aspect of the original cover and other typical elements of the Spike and Suzy album covers such as the orange colour, font, characters, and title. The main differences between the two works lie in the substitution of the Spike and Suzy’s character for a depiction of Ghent’s Mayor joined to the characters chosen to pick up the coins conveying a discriminatory message and the addition of a handwritten statement “Fré freely in the style of Vandersteen”. At national level, the court of first instance granted an interim injunction preventing further distribution of the calendar. Subsequently, the defendants appealed arguing that the work is allowed as it falls under the parody exception. The applicant also appealed to prohibit the political party to use the protected works in any manner. After recognising the absence of uniformity in the legal tests applicable to the parody exception, the Brussels Court of Appeal decided to refer to the Court of Justice of the European Union (CJEU). 1. Is the concept of 'parody' an independent concept (read “autonomous concept”) in European Union law? - mention the source of the parodied work? 3. Must a work satisfy any other conditions or conform to other characteristics in order to be capable of being labelled as a parody? Before turning to the analysis of the questions referred by the Belgian court, the AG notes what is not asked of the court and consequently, what is left out of the opinion. Firstly, as moral rights are excluded from the scope of the directive (recital 19), their ensuing violation is left to the assessment of national judges. Secondly, the interpretation of the three-step test enshrined in Article 5(5) of the directive requiring copyright exceptions to be applied “in certain special cases which do not conflict with a normal exploitation of the work or other subject-matter and do not unreasonably prejudice the legitimate interests of the rightholder” is also left out of the questions referred. Accordingly, the AG emphasises the role of the national judge to verify whether these conditions are met in the dispute. Finally, the AG observes that the Belgian Court does not ask the CJEU to evaluate the Belgian limit to the exception whereby the exception is applicable if the work is created in accordance with honest practices (see Article 22(1)(6) of the Belgian Copyright Act 1994). In relation to the first question referred, the AG states that “parody” is an autonomous concept of EU law, because the Directive refrains from defining or expressly referring to the Member States for the definition of that concept. This being said, the AG adds that when EU law does not provide sufficient guidelines, the nature of an autonomous concept does not preclude Member States from having a large margin of appreciation to determine the requirements attached to the exception. Turning to the two other questions referred, the AG decides to address these together as they relate to the requirements for invoking the exception. Firstly, the AG notes that there is no significant distinction between the three concepts mentioned in the provision (parody, pastiche and caricature) and considers them together as they all share the common feature of being an exception to copyright. After consulting dictionaries to grasp the ordinary meaning of parody and its Greek etymology, the AG establishes common features to any parody. These comprise structural and functional features. A parody is simultaneously copy and creation. The nature of parody requires borrowing elements from earlier works. These elements borrowed can consist in essential elements of the original work as for the parody to be successful the earlier work must be recognisable to the public. But the parody is also creation as the parodist distorts the original work and it is in his interest that the public does not confuse the new work with the original work. Against this backdrop, the AG attributes to Member States the duty to determine whether the new work incorporates enough new elements to not constitute a mere copy of the original with little modification. In light of the foregoing, the AG notes that Member States can adopt different requirements such as the absence of confusion, sufficient detachment or whether more elements are copied than necessary. In a nutshell, the parody needs to be original in a sense that it must not be confused with the original work it borrows from. To break down the reasoning, the AG distinguishes between its subject, effect and content. Firstly regarding the subjects (or targets) of parodies, the AG supports that parody works can either target the earlier work or its author, or a third subject external to the work it borrows from. Secondly, the effect of the parody must be humorous. However, the AG leaves the assessment of the kind of comical effect required to Member States which bear an important margin of appreciation to determine whether the parody meets this threshold. Thirdly in relation to the content of parody and the influence of fundamental rights, the AG examines the relationship between copyright (Article 17(2) of the Charter of fundamental rights) and the parodist’s freedom of expression (article 11(1), EU Charter of Fundamental Rights). The national judges must bear in mind the importance of preserving the freedom of expression, an essential feature of any democratic societies. This being said, this right is not absolute. Besides the limits on the right set out in Article 10(2) of the European Convention on Human Rights, the Charter protects other values which may conflict with the freedom of expression such as human dignity (Article 1 of the Charter) and non-discrimination based on cultural, religious and linguistic diversity (Article 22 of the Charter). Based on this, the AG notes that the parody exception should not be refused just because the author of the original work does not approve the comment made through the parody. Nevertheless, the AG suggests an important limit upon the application of the exception by stating that the exception is inapplicable where the parody conveys “a message radically contrary to the deepest values of a particular society” (this quote is translated from the French version by the author of this post). In conclusion, national judges must weigh the different fundamental rights in relation to the circumstances of the particular case. As this is the first parody case referred to the CJEU, this dispute is likely to attract a lot of attention and possibly, criticisms. By making “parody” an autonomous concept of EU law, the AG follows the CJEU’s consistent approach endorsing the need for a uniform application of EU law. For example with the Padawan decision in relation to the autonomous concept of “fair compensation”, the Court stated : “according to settled case-law, the need for a uniform application of European Union law and the principle of equality require that the terms of a provision of European Union law which makes no express reference to the law of the Member States for the purpose of determining its meaning and scope must normally be given an independent and uniform interpretation throughout the European Union; that interpretation must take into account the context of the provision and the objective of the relevant legislation” (See Padawan at para 32). Interestingly, when it comes to defining what parody consists of, the AG chooses not to distinguish the three terms parody, caricature and pastiche. This appears to be in line with the nature of parody which is seen as a multivalent term covering among others satire, pastiche, caricature, spoof, irony and burlesque. By the structural feature, the AG acknowledges the particular nature of parody which requires both copying and creation. The AG infers that national judges have to weigh whether the parody comprehends enough creation to exclude representing a slavish imitation of the original. Ultimately, this is where the difficulty lies as parodist needs to copy enough elements to trigger the memory of the original work in the public and simultaneously, supply enough new elements to avoid confusion. Against this backdrop, the AG requires the parody to be original rather than a mere copy with little alteration of the original. One is allowed to wonder what kind of originality is required. Are we talking of the ordinary meaning of originality or the copyright law meaning (i.e. “original” enough to trigger copyright protection)? On this question, the AG seems to leave the assessment to the national judges. Moving on to the functional features of parody, the AG appears to allow the application of the exception to both target (commenting either on the work it borrows from or its author) and weapon parodies (using the parody to comment on a third subject). This approach departs from the US distinction made in the landmark Campbell decision where the US Supreme Court held fair use applicable only to target parodies. This being said, this brings the EU closer to other jurisdictions such as Australia and Canada where legislators rejected the distinction between target and weapon parodies in the wording of the provision. The effect of parody needs to be humorous. The assessment of the required comical effect is left to the national judges and depends on the particular circumstances of the case. However, the AG appears to be in favour of a liberal interpretation as the parody exception relies heavily on freedom of expression considerations. This being said, one wonders whether the effect equals the result of the parody itself. Indeed problems could arise if it is the effect of the parody on the public which is required. This is explained by the fact that this effect relies on several accounts such the talent of the parodist but also relies on the public exposed to the parody. Finally and surprisingly, the AG appears to let the Member States (and especially the national courts) assess the content of parodies. By weighing the different fundamental rights at stake, the courts can limit the application of the parody exception where the message is radically contrary to the fundamental values of a particular society such as xenophobia, racism and homophobia but could be extended to other cultural diversities as long as these are considered by national courts jeopardised by the parody. This last point promises to attract many criticisms as it is an open door to a kind of censorship. In conclusion, much leeway is left to national judges and it is not given that this interpretation amounts to harmonisation among the Member States. Finally, whether the approach of the AG will be followed by the CJEU remains to be seen. Although the parody clause in the Infosoc Directive is an option for Member States, I think it might be arguable, at least in some cases, that the EU Charter of Fundamental Rights requires Member States to exercise this option, in order to protect freedom of expression. This is by analogy with the NS ruling of the CJEU on asylum, which said that Member States might be required by the Charter to exercise an option in secondary EU legislation, if this is necessary to secure human rights. The CJEU said there that Member States' exercise of an option in EU legislation falls within the scope of the Charter, because EU law has set up a system to regulate asylum. Similarly in Case C-13/00 Commission v Ireland (at para 17) the CJEU said that the subject-matter of the Berne Convention, ie copyright and related rights, was 'to a very great extent' governed by EU law. Of course freedom of expression could still be limited in accordance with Art. 10(2) ECHR and Arts. 11 and 52(3) of the Charter. Perhaps the CJEU might think it has to make up for its limited interest in freedom of expression in the Google Spain judgment? I think it would be more appropriate to say that, under the AG's opinion, the courts MUST limit the application of parody exception when the conveyed message is tainted by racism, xenophobia or other inacceptable views. It is also relevant to note that, infofar I understand, that the AG, in discussing what kind of "views" should be not covered by the parody exception, did not refer to those of a particular national society (i.e., those of the specific natioanl society to which the judge ad quo belongs); rather, he referred to those values (in particular, respect for the human dignity) which are at the core of the European society itself.